When my family went to New Orleans over this last Christmas vacation, we pretty much ate the whole time. Apparently that’s what Mormons do when they go to New Orleans with (or without) kids because drinking and naked people are both off the table (figuratively…I’m pretty sure there are plenty of both drinks and naked people on tables in New Orleans. This has taken a weird turn). Anyway, it was seriously the most delicious vacation I’ve ever taken. During all of our eating, we made kind of a funny discovery–when you order sausage for breakfast in New Orleans, you don’t get breakfast sausage, you get a big ol’ hunk of smoked sausage. And when you order a Cajun-Style Hash Brown Skillet in a (very) feeble attempt to offset the 3 beignets and hot chocolate you also ordered for breakfast, it also comes with smoked sausage. Luckily, it’s flavorful and delicious and awesome. Now…you can make your life easy and you can make your life hard here. I am using pre-packaged potatoes O’Brien (frozen hash browns with onions and peppers), but if you’re a super awesome overachiever, you can make your own and throw in a green or red pepper (or half of each). Also, speaking of overachieving, check out these awesome eggs I collected from my chickens this morning! Just kidding. These beauties came from the farmer’s market. In the words of Taylor Swift, I will nevereverever own chickens. They combine three of my greatest phobias: poultry, their potential offspring, and the eventual and inevitable killing and eating of animals that I knew when they were babies. Do I think eggs are pretty? Yes. Do I cook with them frequently? Yes. Do I ever eat them? Rarely. I’m a freak. You’re going to need your potatoes, whether you buy them or make them yourself, eggs, Andouille or other smoked sausage (if you don’t live in a place where there’s an entire giant section of the meat case in the grocery store devoted to smoked sausage, Costco and Trader Joes often carry Andouille sausage), butter, garlic, and cajun season (like Tony Chachere’s or Tabsco sauce and a sprinkling of kosher salt). If you feel the urge, you can also add a sprinkling of pepper jack or sharp cheddar cheese in the last few minutes of cooking. 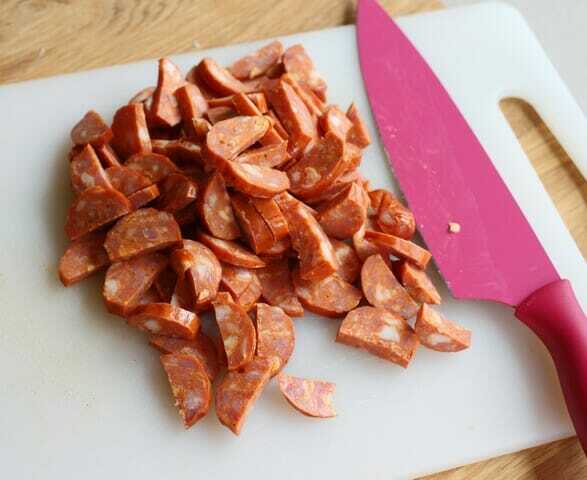 Slice the sausage and set it aside. Preheat your oven to 350. In a 12″ (or larger) oven-safe skillet (preferably cast-iron), heat the butter over slightly-hotter-than-medium heat. 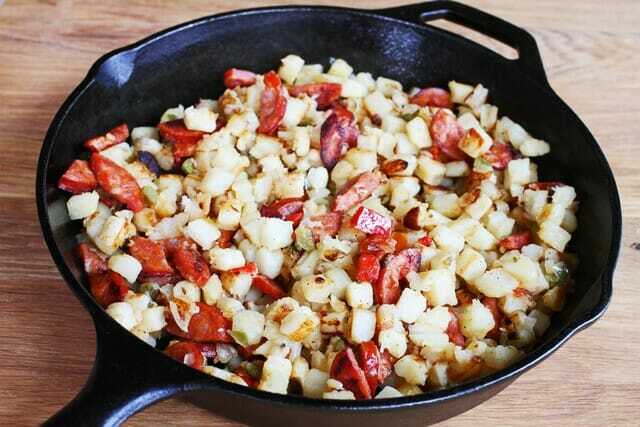 Melt the butter in the heated skillet and add the garlic and sliced sausage. Cook until the garlic is tender and fragrant. Add the potatoes and cook according to the package/recipe directions until crispy on the outside and tender inside. Season to taste with Cajun seasoning or Tabasco sauce. Remove from heat. Using a spoon, make 6 evenly-spaced indentations into the potatoes. Carefully crack an egg into each well and, if desired, sprinkle lightly with Cajun seasoning or salt and Tabasco sauce. Bake in the preheated oven for 18-25 minutes or until the egg whites are completely cooked but the yolks are still runny (mine were done at exactly 20 minutes, but you want a little give or take in each direction). If you want to add cheese, do it in the last 5 minutes or so of cooking. Carefully spoon out of the skillet and serve immediately. Makes 6 servings. browns, push them off to one side of the pan and reduce the heat to medium-low. Whisk 6-8 eggs, a splash of water, and a few dashes of Cajun seasoning or salt and Tabasco sauce together in a small bowl. 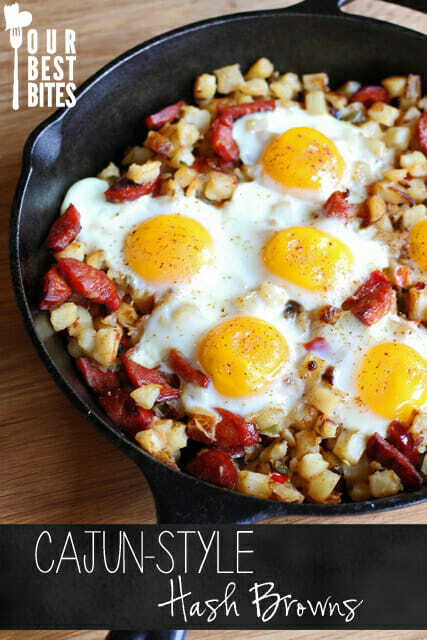 Melt a tablespoon of butter on the cleared side of the skillet and slowly add the whisked eggs. Use a rubber spatula to drag the scrambled egg curds across the pan until the eggs are cooked. Combine the scrambled eggs with the potatoes and if adding cheese. add it now and let it melt. Serve immediately. A yummy Cajun-Style breakfast bursting with flavor! Preheat oven to 350. In a 12″ (or larger) oven-safe skillet (preferably cast-iron), heat the butter over slightly-hotter-than-medium heat. Melt the butter in the heated skillet and add the garlic and sliced sausage. Cook until the garlic is tender and fragrant. Add the potatoes and cook according to the package/recipe directions until crispy on the outside and tender inside. Season to taste with Cajun seasoning or Tabasco sauce. Remove from heat. Using a spoon, make 6 evenly-spaced indentations into the potatoes. Carefully crack an egg into each well and, if desired, sprinkle lightly with Cajun seasoning or salt and Tabasco sauce. Bake in the preheated oven for 18-25 minutes or until the egg whites are completely cooked but the yolks are still runny (mine were done at exactly 20 minutes, but you want a little give or take in each direction). If adding cheese, do it in the last 5 minutes of cooking. Carefully spoon out of the skillet and serve immediately. Makes 6 servings. Instead of the runny egg, after you cook the hashbrowns, push them off to one side of the pan and reduce the heat to medium-low. Whisk 6-8 eggs, a splash of water, and a few dashes of Cajun seasoning or salt and Tabasco sauce together in a small bowl. 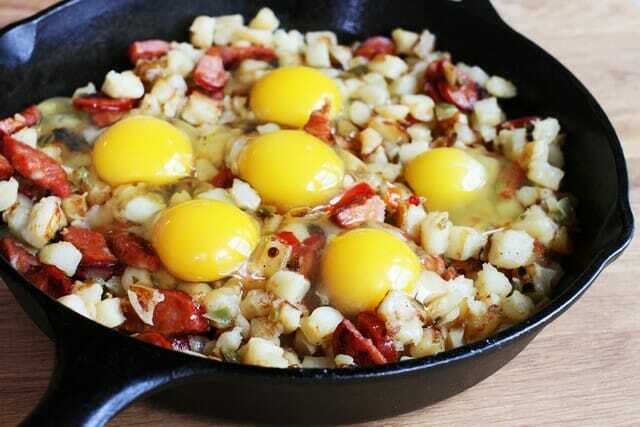 Melt a tablespoon of butter on the cleared side of the skillet and slowly add the whisked eggs. Use a rubber spatula to drag the scrambled egg curds across the pan until the eggs are cooked. 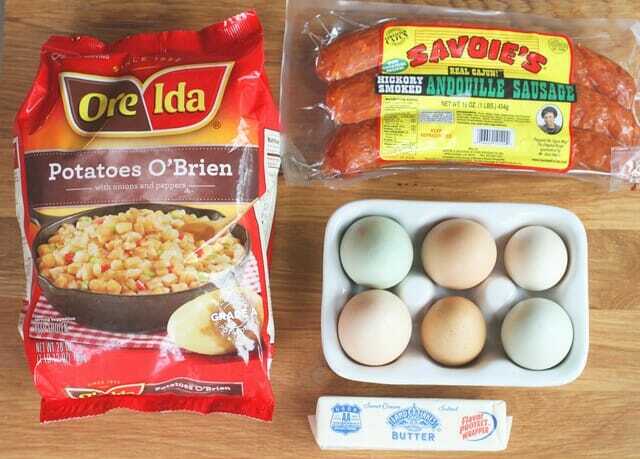 Combine the scrambled eggs with the potatoes and add cheese if using. When the cheese is melted, serve immediately. For the potatoes, you can also try this recipe and add in a green or red pepper (or half of each). This looks GREAT, as your recipes always do! One quick question – where do you find oven safe skillets? I’ve seen the cast iron kinds, but no other version than those (not that there’s anything wrong with those, but I just want to know what other kinds there are out there). There’s a couple of recipes I’ve wanted to try that call for one and I’m never sure what to get. Thanks! You can pretty much find them anywhere. Stainless steel is always a good bet, and even some of the soft handles and non-stick skillets will advertise being oven-safe to a certain temperature. Hope that helps! Oh my goodness, I’m laughing so hard. I’m reading about the chicken eggs and thinking “I thought Kate really didn’t like eggs….like at all….why would she have chickens…” and then I scrolled down. LOL I will also nevereverever own chickens! This looks so good! Your eggs looks perfect! Oh, sweet Kate, I just want you to know that you’ve just made my day. I am having a pretty rotten week…my blood pressure is so high I can feel it in my temple, and this was NOT the week to quit sweets ;). But this post is just so sweet and good and funny that I feel better. Thank you for that. I’m going to have to try this this week…I think I have all the ingredients hanging out in my fridge already :). Wow, this looks seriously amazing. I love eggs, I love potatoes and I love sausage. Yum! Besides green and red peppers, what other veggies can I add to this? It looks so yummy! You could add pretty much anything you like on omelets–tomatoes, roasted red peppers, mushrooms, green onions, etc. I’d probably steer clear of broccoli, cauliflower, asparagus, etc. Those eggs look very much like the I ones gathered from my coop. Chickens are awesome; you really should give them a try! They are cute and funny pets that give you food. We don’t eat the chickens though, just the eggs. The scrambled egg version of this has me droolin’ on the keyboard, and I just finished dinner, lol! Between the nekkid people on the table and the scarey chickens and the scarey runny eggs, this is one of the funniest posts you’ve ever written. Don’t stop! The eggs are beautiful! Much like what I get every day from my chickens. I don’t eat my chickens, yet. 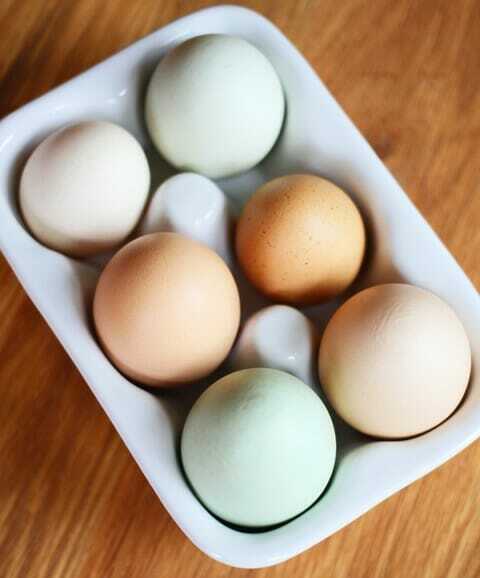 I do love having fresh eggs. They taste great and make everything I make with them taste better. That dish looks great too. I love all Cajun food, and especially look forward to our vacations to New Orleans! Luckily living in Texas, we can get Andouille sausage at all our local stores! This Cajun menu is amazing. The eggs are perfect. I don’t have any cast-iron skillets. Wish my stainless saute pan will do the same job well. I thought I was the only one who felt that way about eggs so I was literally laughing out loud reading this. And as for the chickens, we just moved to the country and got our kiddos 6 baby chicks for Easter. (For the eggs not the meat.) My rule is any animals at my house will never be food, I’m a horrible farmer lol. I just made this for dinner and the problem I had was with mushy potatoes, I could not get them to brown and crisp. Is a cast iron skillet the secret to that? I used a stainless one. Other than that it was a good and easy weeknight dinner. By the way, according to my husband I’m the best cook ever (thanks to your site 🙂 so thank you! Quick question: is tony what’s-his-name’s creole seasoning the same as Cajun? I checked my cupboard and all I’ve got is the creole stuff. Thanks a bajillion for all your amazing recipes and fun posts. You gals are my absolute favorite! I made this for dinner this week and it was a huge hit with my husband. I took leftovers for lunch the next day and every one at work couldn’t get over how great my lunch looked and smelled that day. Yummy stuff! 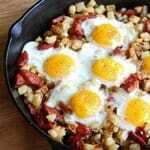 Have you ever made this with shredded hash browns? i bought the wrong ones at the store. Made this for breakfast today. YUM! Made it extra spicy since no kiddos were home to have some. I made this yesterday. It was a supper tasty and delicious. Thanks! ❮ Previous Post Previous post: Escape with Dark Chocolate: Printable Wrap!